You may not think that you have a lot of options for making your concrete floor look great other than trying to keep it as clean as you can. That can be harder than it seems since the concrete is porous and can stain easily. Plus, concrete is often used in spaces like garages where work is conducted, so the types of liquids getting into those pores are hard to clean up as is. Cleaning Chandler concrete floors is no easy task. You may need a pressure washer, and you will certainly need specialty cleansers. You’ll also have to put in a lot of elbow grease and many hours of your day to get them properly clean. By investing in concrete floor coatings, you will make it much easier to maintain your concrete floors, which will save you both time and money. These Chandler floor coatings create a barrier between the concrete and debris. Liquid, dirt, and bacteria are not as likely to penetrate to the concrete – especially if the coatings are well-maintained and were properly applied. All you should have to do to keep the floors clean is use a soft cloth and the appropriate cleanser to get up the material. Since concrete floor coatings act as a protective layer on the concrete, staining is nearly impossible. Materials like oil, beverages, or dirt cannot penetrate the concrete, so they cannot settle in and create a stain. That means you won’t have to spend the time and money on the AZ professional cleansers or services to remove those stains. The coatings also help to prevent damage to the concrete. When oil, gas, and other items get into the concrete, they can break it down over time. By applying an epoxy coating near Chandler to your concrete floor, you can minimize damage to it, saving you big on repair or early replacement. By protecting the floor from damage, epoxy coatings also protect the life of the concrete. It’s no small expense to repair or replace a concrete floor, so by investing in epoxy coatings, you are potentially saving yourself a lot of money and hassle. You may even be able to extend the life of your concrete floors beyond the average, saving yourself even more money. A decorative concrete overlay or other epoxy coatings can transform concrete floors. These coatings can take concrete floors from drab and dusty slabs to smooth, glossy, and stylish floors that look like they belong in a high-end home or commercial space. Not only will that improve your enjoyment of the space, but it will also increase the value of your property. If you are planning to sell, those concrete floor coatings near Chandler can give you a nice boost on the closing price. But even if you aren’t planning to sell, you can still benefit. You can get a higher value on a new home appraisal, which can give you more equity when you want to apply for a line of credit. A decorative concrete overlay, concrete stains, and other epoxy floor coatings can significantly improve the look of your concrete floors and make it easier to maintain them. You will improve your home or business with the investment, and you will reap many cost benefits. 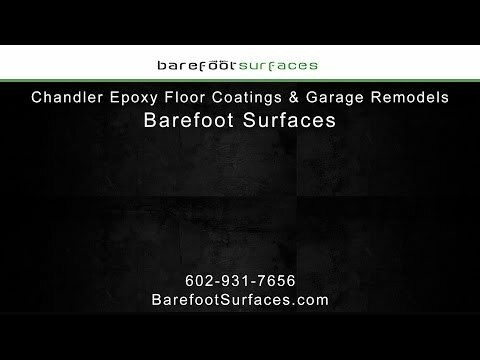 Barefoot Surfaces in Arizona can help you get beautiful concrete floors, whether you want to upgrade the look of your floors or you need to repair and restore your crumbling concrete floors. We provide decorative concrete overlays for concrete floors in any room, as well as concrete stains, metallic epoxies, and plain epoxies that put a shine on the floor and seal it against dirt and debris. We can update the floors in your garage or your living room, and we’ll get the same great results no matter the current condition of your floors. Contact us in Arizona to learn more or to get an estimate for your job.